If you have decided to own a hermit crab for a pet, chances are you are still unaware of the things that will keep your potential pet happy and healthy. This post may provide the details that you may be looking for when selecting the best substrate for hermit crabs. You may not totally agree to the fact that the substrate is the most essential element in a hermit crab’s habitat or habitat as what many hermit crab keepers like to call it. In their natural habitat, hermit crabs love to dig burrow themselves under the substrates as this keeps them warm and protected when the weather gets unpleasantly cold for them. They also need to cover themselves and to have complete darkness so they can secrete their molting hormone, called ecdysone, to do its wonders. Once the process is completed, the substrate covering them will provide the protection that they need until their outer skin hardens and they gain muscle control once again. 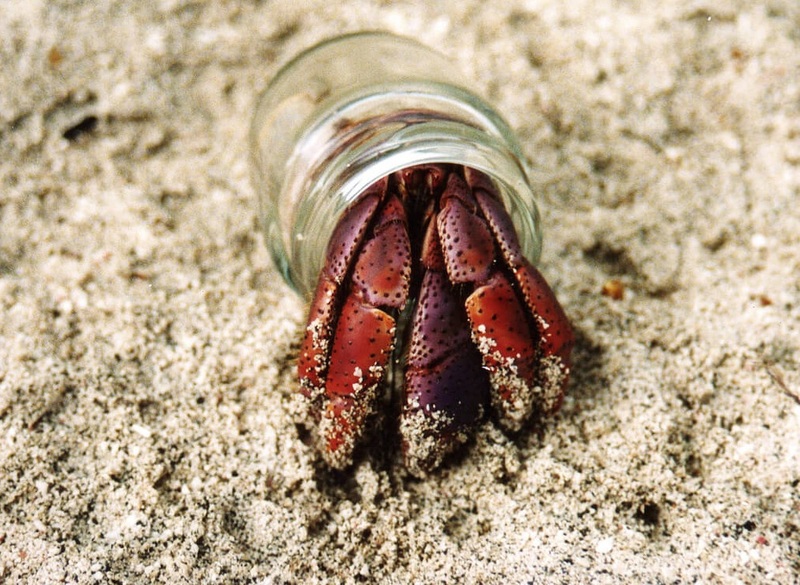 During this period, your hermit crab is a potential threat to predators. Covering themselves with the substrate not only keeps them safe, but it can also provide the much-needed moisture that will keep them from drying out or becoming dehydrated. Dangerous Dog Bill introduced in Michigan. Introduced by Rep. Sean McCann targets unsafe dog behavior instead of targeting dogs as dangerous breeds. This is a step in the right direction. With so many “breeds” on the dangerous list and so many that are even banned in certain areas, finally it may go by how a certain dog behaves. I’m sharing this information from Michigan Live News in Kalamazoo. Laura Blanchard is a mail carrier who was attacked and later contacted Rep. McCann. These are the photos of the puncture wounds Laura received when she was attacked by a pit bull, her wounds required more than 40 stitches. The following article was written by Rosemary Parker for mlive news. LANSING, MI –” State Representative Sean McCann (D-Kalamazoo) has introduced a bill that would protect kids, pedestrians, letter carriers, utility workers and animal control officers from dangerous dogs. McCann’s bill focuses on specific dog behaviors, rather than breeds, by providing a framework for determining which dogs are dangerous and requiring their owners to take steps to protect people from them. The proposed legislation would exclude hunting and livestock guard dogs acting as expected, dogs that attack trespassers, dogs that attack people who are in the act of committing crimes or attacking their owners or family members, dogs that attack people tormenting them or attacking other animals that have attacked them first, and details other specific circumstances that would excuse aggressive behavior. McCann, who is a dog owner himself according to a news release about the proposed bill, authored the bill after a local letter carrier approached him to talk about the danger some dogs pose, and it could also prevent more tragic deaths from dog attacks, as happened in Lapeer County in July. “The best predictor of future behavior is past behavior,” McCann said. “If a dog has established a pattern of aggressive behavior, its owner must step up and keep it from hurting anyone else. Under McCann’s bill, a hearing would be held once a valid complaint has been filed against a dog. If the dog is found to be dangerous or potentially dangerous, the court can order an animal to be registered as such. Once a dog is registered as dangerous, local letter carriers and utility companies would be notified of its address, and owners who don’t comply with court orders regarding their dangerous dog would be guilty of a felony. “Had this bill been law, the recent and tragic death of a jogger in Lapeer County could have been prevented because previous complaints had been made against the dogs that attacked him,” McCann said. “Dogs with a violent history must be kept from attacking again, and their owners must be held responsible for their behavior, just as I would expect to be held responsible if our family dog, Arnold, ever threatened someone. What a difference this bills passing would make in the lives of dog owners whose dogs have been put in the category of “dangerous dog” that are not dangerous. I know many Michigan residents will be waiting to hear the outcome of this bill. 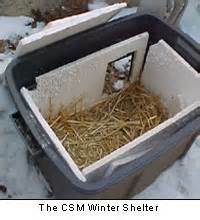 Cozy winter homes for feral cats, you can help feral cats survive the winter by building them a shelter. This coming winter is being forecast as a re-run of last winter. COLD!! 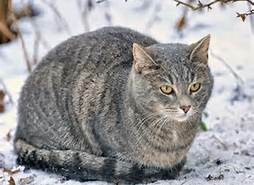 If you would like to make a cozy winter home for the feral cats in your area, build it soon and put it where they will find it BEFORE the weather gets cold. That way they will already be accustom to it and will use it sooner. Many of these homeless cats die every winter from exposure to the winter elements. There are several shelters you can make to help them stay warm throughout the winter months. Heavy cardboard boxes covered and taped with heavy plastic are cheap and easy to make. Or you can build one out of plywood and staple home insulation to the inside walls and on the shelter floor outside on the bottom. Your shelter should be 2 to 3 feet long. You can get really fancy by building a small doghouse like one with a small opening for them, small enough to keep large animals from getting in. Be sure to seal the seams of your wooden ones with silicon caulk to keep cold air from getting in. Put your shelter up on blocks so that the bottom isn’t setting on the cold ground. Place it so that the sun warms it during the day, or use an old solar pool cover to really add warmth. Adding a small entryway to the front or angling the front down will help keep the cold winds from getting in. Putting it close to a building and facing south will also help keep winds out. Then put in a nice layer of fresh straw inside. Be sure it stay DRY! Here are some examples of cozy winter homes for feral cats! 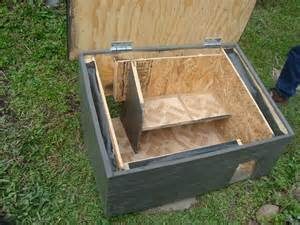 Another cozy home for feral cats~~Do you have an old large cooler? These are perfect, easy and WARM. Cut a hole in the side, put a nice layer of clean, fresh dry straw inside and close the top. Keep a cleared path so they can easily get to and from their cozy home. Give them fresh food and water daily at the same time and they will quickly learn and be there when feeding time comes. Canned food is a nice treat for them, another good and nutritious treat is “CatSip” it’s made from real milk and cats can easily digest it! Always leave plenty dry food, they need the extra calories to help keep them warm. Bring them warm water everyday too. It will stay unfrozen long enough for them to get a drink. DO NOT USE METAL BOWLS. Their tongues can freeze to the bowl. If you have an electrical outlet close by you can give them a heated bowl to keep their water from freezing. Please share this post so others may think about building a “cozy home” for these special cats! Pet healthcare costs are on the rise just like healthcare costs for us. These rising costs are making it extremely difficult for many pet parents to keep their pets healthy. Many pets are euthanized because the owners cannot afford their healthcare. We frequently see stories about pet parents whose beloved pet needs emergency surgery or pets who have been diagnosed with an ongoing healthcare issue requiring expensive medications for life. Pet healthcare costs can be lowered greatly in several different ways. There are many pet health insurance companies around today. Did you know that many pharmacies also participate in lowering the cost of your pets medications? I recently did a post about my “Heart Dog” Ashley, in that post I mentioned the fact that we called her our million dollar dog. When Ashley was young Pet Healthcare Insurance didn’t exist. During her lifetime we spent thousands of dollars on her healthcare. Fortunately, along came Pet Healthcare Insurance. Ashley got her policy when she was about 10 years old. Since Ashley, all of our furkids have had a policy, and when you purchase a policy when they are young the cost is very affordable, and when you do the MATH, you will find that you would spend MUCH more without it. Example, one visit for dental cleaning can easily end up costing you well over $500.00 if there are extractions needed. With Pet Healthcare Insurance~you pay only a portion of it. As your pet gets older naturally the cost of the policy goes up, BUT, again, one visit can cost you much more than the annual premium. Ashley’s policy at 16 1/2 years old was $351.00 per year. She had kidney disease the last several years of her life, which often required days of IV therapy, our cost $O.00 after the $50.oo deductible was met on the first visit. I strongly encourage everyone to do Pet Healthcare insurance comparisons. You’ll find that it’s much easier and affordable than you think, with many payment options. 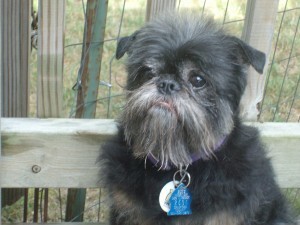 To find assistance when you cannot afford Pet Healthcare costs for your pet there are several options. 1) The Pet Fund , this is a Sacramento CA. based non-profit that distributes the funds directly to the veterinarian when funds are applied for. There you will need to apply, showing proof of income and eligibility. This may not work if the funds are needed immediately. 4) Another option, perhaps your veterinarian has a secret angel program. These are usually programs where other customers and local business donate funds for those pets and their families in need. Ask your vet the next time you visit. Pet Healthcare cost often include medications for your pet. Sometimes these medications are life saving, often times they are human medications. Did you know that many pharmacies participate in discounts for your pets medications? You can locate a pharmacy near you and receive discounts. Here you can apply for a discount card. Booth and Little Miss Baily have their discount cards. I do hope with the links I’ve included here that you find a Pet Healthcare policy and pharmacy that will help you keep your pet happy and healthy at a cost you can afford. I would love to hear your thoughts on the Pet Healthcare costs issues! Human foods for cats, ever wonder if that snack your cat is begging for is actually safe for them? I know Princess Lily is constantly begging for human food, and I often wonder if some things are actually safe for her to eat. I found a great inforgaphic that will answer some of those questions with a quick glance at this chart from Petcare. At Petcare you can shop food and treats and get more information about dog and cat health. What a great infographic, share this one with fellow cat lovers so they too will know what human foods are safe for their special kitty! I do think that Booth may be about done with winter! Dogs understanding, have you ever heard about a dog going from one home to another or those that are surrendered several times? I’m sure you have. It happens all the time. Our Little Miss Bailey had 5 homes before she was a year old, we were number 6. Dogs understanding is something anyone adopting a dog should think about. Dogs, like children do not come into this world understanding the words we use to get them to do something. Dogs understand when we talk baby talk, praise and good stuff, why~because of the tone of voice. Just like humans, they know the difference because of the tone of voice we use. Think about when you’re trying to teach your dog something. You’re not using the same tone of voice you would if you were praising or talking the good stuff to them. Many dogs who are in rescues and shelters have had lives, they have lived with people, they may have been taught some commands. Then again~maybe not, maybe their previous owners didn’t teach them anything, maybe they don’t know the rules of behavior. More often than not, this is the reason they end up in a shelter or rescue. It’s sad because would people give up a child because it didn’t always behave. 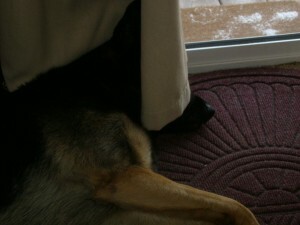 Dogs understanding is the reason many dogs are surrendered yet again because of their lack of training. Each time they find themselves back in that cage, their confusion grows. They do not understand what they did~this time~to end up back in a cage. Why? Because dogs are like children, they are not born understanding the words we speak and what we want them to do. Many people don’t even realize that when training a dog, different people use different words. Example, we use the word Platz instead of lay down, or down. The reason for this is because if someone wants one of our dogs to not jump up, they say “get off, get down”, we say, “Off” to keep them from jumping up and Platz for them to lay down. We think using those words is less confusing for them, AND there is a huge difference in the “Meaning of the command“. 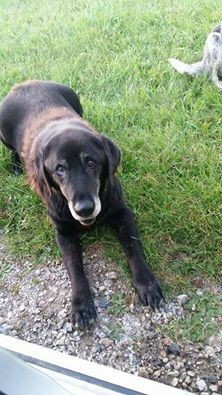 When an older puppy or dog that has been surrendered comes into a home, people need to remember, Dogs are like Children, they are not born understanding the human language. A thought provoking check list for dog lovers, who unfortunately and with much sadness can no longer take care of their dog. 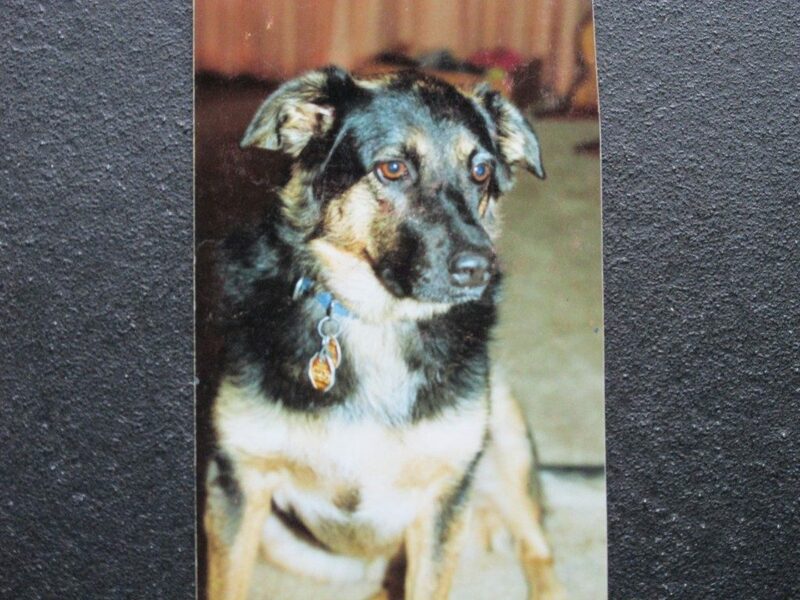 This book will assist those who want to prepare for their dogs future in an easy to use format that will guide them through the process of telling the “story” of their dogs life, for their pets “Next Guardian”. 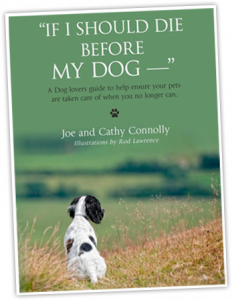 None of us can predict the future, but in the event situations arise such as death, health impairment or left with no other choice but to give them up, this book will be there to assist your beloved pet with the transition from one home to another.